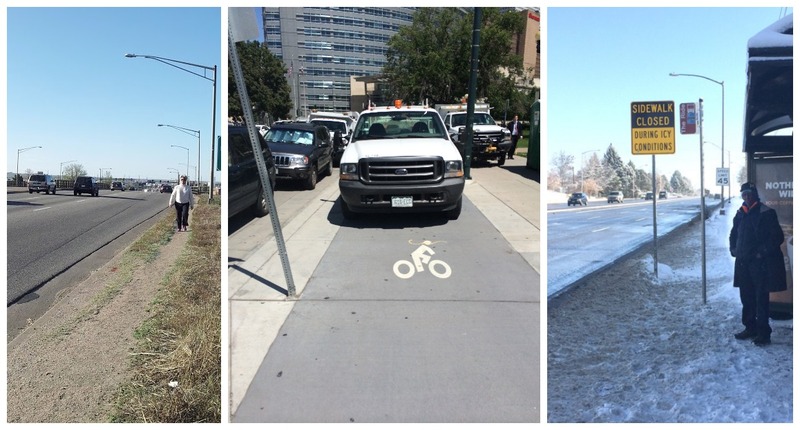 Since Streetsblog Denver launched last May, we’ve beat the drum to make the Mile High City’s streets better for walking, biking, and transit. We’ve been watchdogging how city agencies implement policy and questioning the car-centric status quo peddled by local decision makers and media figures. What has to change to make our streets safer, more urban, and more equitable? To tell the story, we want help from our readers. When it comes to streets, visuals can communicate in a way that words alone can’t. Streetsblog wants your photos of streets that aren’t getting the job done: dangerous designs, shoddy infrastructure, or any situation you come across that illustrates how current conditions prioritize multi-ton motor vehicles above people who walk, bike, or ride the bus. Share your pictures and video on Twitter and Facebook with the hashtag #StreetFail, and let us know. (You can always email me too.) We’ll grab the attention of decision makers by sharing the most effective photos on the blog. We want to see when streets are done right, too. A safe, functional bike lane, a stellar pedestrian intersection, or a dignified bus stop, for example. Use the hashtag #SweetStreet, and we’ll publicize those photos and videos as well. Our goal is not just to inform readers with original reporting, but also to get people involved in calling for change on Denver’s streets. Share your photos with us and let’s get started.